After all the hub-bub over The Phantom Pain whether or not it’s a Kojima Productions game has finally come to an end. It was him all along! Big surprise but bigger surprise is what was unveiled at GDC. Kojima walks out in the same garb as the character in the original trailer. 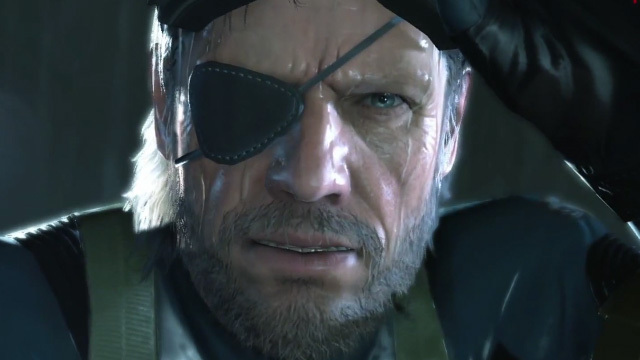 He premieres a new trailer with footage from Ground Zeroes and Phantom Pain to become Metal Gear Solid V.
From what we know about the story, Snake’s been in a coma for nine years. He’s missing an arm and using a prosthetic and it’ll be an open world game. The platforms so far announced are Xbox 360, PS3 but the game was running on PC. The original Phantom Pain trailer is the tutorial for the game. We’ll update the post with the trailer when it becomes availble but if you’ve seen it, it looks amazingly gorgeous. The FOX engine looks crazy realistic with some images hard to discern what’s real and what’s not which is going on at their GDC talk currently. “Ground Zeroes” is a prologue of “MGSV”. 9 years after that event will be “The Phantom Pain”. MGSV is constructed w/ prologue and main game “TPP”. The game play demo I presented today is the opening of “TPP” which is tutorial that starts from crawling.